Skyfall opened today nationwide and I’ve just seen it. I promised myself I would write a few lines about it when I got home, before I read what anyone else thought of it. Because I’ll post this online I’m mindful of not spoiling the film for those many who haven’t seen it yet but who doubtless will soon. It’s not easy to be spoiler-free. Everything you learn about a film, before you see it, spoils it in some shape or form. Skyfall… those three dots represent me pausing and staring at the computer screen for a while… there, I did it again. Come on, Ken, do it. 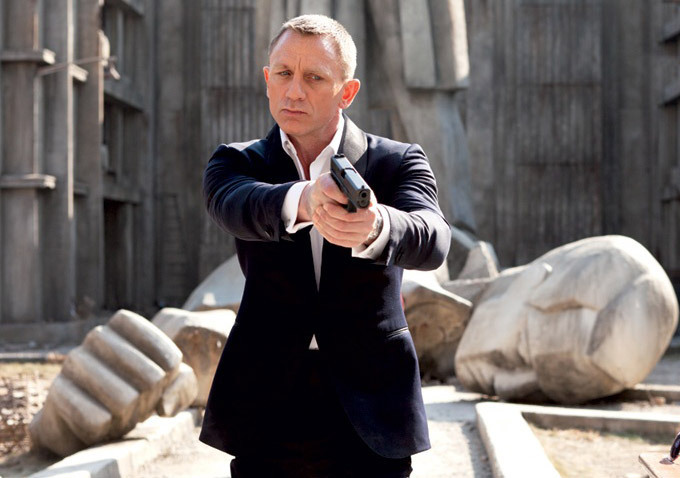 Sam Mendes has ‘delivered’ Bond. That’s the main thing to say. He’s just simply ‘delivered’. And that’s an incredibly difficult thing to do because people want different things from Bond now. It’s not enough to be a gambling philandering super-agent who saves the world, neither is it enough to be a broken reflective dinosaur of a man in a world which has largely passed him by. But these are some of the conflicting things that people want. They want the three dimensional Bond, that’s what they want. But Bond can never be three dimensional. He is, in truth, the very epitome of two dimensional. He is totally ‘of the page’ and ‘of the screen’, a fantasy man if ever there was one. That is the magic of what Daniel Craig can do, he can be a two dimensional fantasy man but he can make him bleed believably. Craig is simply magic in the role. Who was the person who first looked at him and saw Bond? That person is the equivalent of the man who first decided it might be nice to eat an Oyster. I never believed in Craig until I saw him do it on screen but tonight I saw him do it again and now I believe in him even more. Mendes gives us practically every Bond we could possibly want. He gives us blinding action moments, he allows us a title sequence that Maurice Binder would have been extremely proud of, he gives us statuesque Bond, ruthless Bond, horny Bond, broken Bond. He take us everywhere that we feel we should like to go with the James Bond film. Then he takes us where we didn’t even know we wanted to go… until he takes us there and that is the best of all. Ken. Ken. You haven’t said if you like it. Not everyone in the cinema liked it though. It is a long film and it is, shall we say, ‘elegantly-paced’ at times. I think people occasionally found the gaps between action sequences a little long. I can say that I personally did not but I think my son did. He will never admit it, being a stoic little dude, but this Bond may not be a twelve year olds absolute delight. Maybe that’s no bad thing either. They have their own stuff, allow us this rather grown up fun. I can’t tell you about the things I absolutely loved without spoiling it for you and I encourage you to see it without it being spoiled, if at all possible. There was a moment where I grunted in shocked sympathy, a moment where I laughed knowingly and another moment where I exclaimed aloud (but quietly) in sheer glee. That’s not bad, is it? Could I pick some holes? Yes I could. I’ll pick one, just to prove it. I didn’t like the so-called Bond Girls. One seemed to be auditioning to be the next 'Doctor’s Companion' while the other seemed to me to be like a semi-drugged parody of a cartoon Femme Fatale. Except in the shower where the water seemed to have some kind of invigorating effect on her. The writers give us scenarios we might half-recognise from other movies then, much more brilliantly, they give us stuff we have simply never seen before. Bond meets some new challenges here, the most remarkable ones being of the most surprisingly mundane kind. It’s filmmaking that cares and I love that. Everybody is trying really hard to make everything the best it can be and largely succeeding. Perhaps nothing can quite match the hype and the expectation of a life-long Bond fan but that hype and expectation is a least half the fun and this film delivered plenty to be satisfied with and perhaps even treasure. One final thought. I must stop watching trailers for upcoming films. It really does the movie-going experience no good at all. I should watch them after I’ve seen the film. That would be better. Nice piece Ken, I agree with the points you raise, especially about the girls (now known as women). There is more I want to say, but I can't without highlighting some of the plot. Safe to say, it was a return to a more tradition incarnation of Bond, with a wink towards his functionality in the modern world considering age and the expectations of his role and the need for it. I liked the default setting. I'll say no more. My lad loved it and filled me in on all the narrative nods towards previous films. Like you, I love Daniel Craig now, probably more so than all of the others who have played the role before him as he is a more accessible Bond in every sense. I would like to see it again and probably will. Excellent post, Ken. I pretty much agree with everything, although I did quite like Naomie Harris despite the quirky Dr Who's assistant vibe. There was a lot of "best Bond EVER" stuff floating around last week, and apart from Casino Royale perhaps, with which it can only really sensibly be compared, I think it is the best, because, well, most of them don't really age very well, do they? And here, with the determined no gadget brief, they're definitely trying to pull away from the old skool Bonds beyond the occasional use of visual and aural iconography. One last thing, doesn't it look amazing? Roger Deakins is fantastic. The neon-flooded empty room scene was amazing, and then he goes to Scotland and you genuinely feel soaked through and cold. Deffo want to see it again on the big screen. The DVD will just never do it justice!